The EaP CSF Steering Committee welcomes the conclusion of the negotiations on the new EU-Armenia Comprehensive and Enhanced Partnership Agreement on 28 February in Brussels and the initialing of the agreed text on 21 March in Yerevan by the Chief Negotiators of both parties. 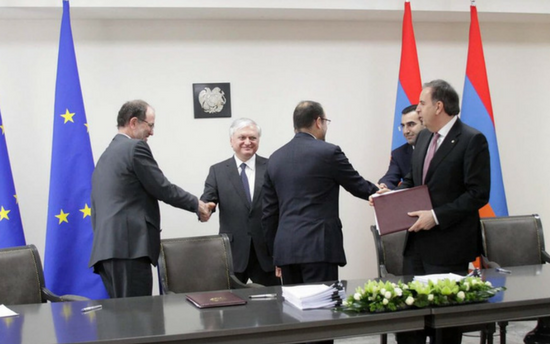 Members of the Steering Committee express their hope that the signature of the Agreement in the near future will contribute to the closer and more effective EU-Armenia cooperation, and to the consistent reform process in the country. However, they are concerned about the fact that the negotiations were conducted behind closed doors and did not involve the consultations with the EaP CSF Armenian National Platform and other civil society actors. “The lack of knowledge among the population about the details of the agreement, especially in light of the active propaganda against the deepening of Armenia’s cooperation with the EU and against the European values in general, present serious risks for the future implementation of the Agreement” says Boris Navasardian, EaP CSF country facilitator for Armenia. The Steering Committee calls therefore on the Armenian authorities and the EU institutions to take into account previous challenges in the process of deepening the EU-Armenia cooperation and to consider a more coherent approach towards a meaningful participation of the civil society in all dimensions of the EU-Armenia relations.